Yet another busy day. I didn't get to take a break until after 2:30 ...ok, technically I've been thinking about ice cream since about 10:30. I decided to head out for a pint of Walgreens goodiness. Actually, let me be more specific. 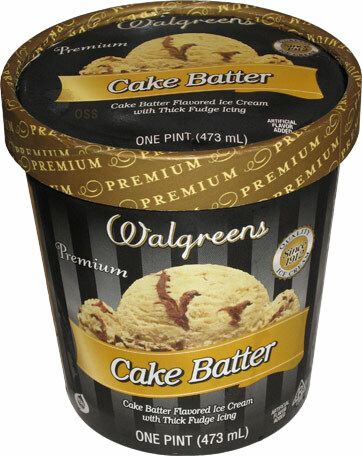 I know Walgreens makes a respectable ice cream, but can they nail the flavor down right? They don't serve "Bear Claw" in a pint, so I decided to go out on a limb and try Cake Batter. I'm always skeptical of these flavors, and it does fail the taste test, but not where I thought it would. It's described as cake batter flavored ice cream with thick fudge icing. The cake batter flavor is decent: it tastes like cake batter and it's not overpowering. I was ready for flashbacks to party cake but instead I got something much more palatable. 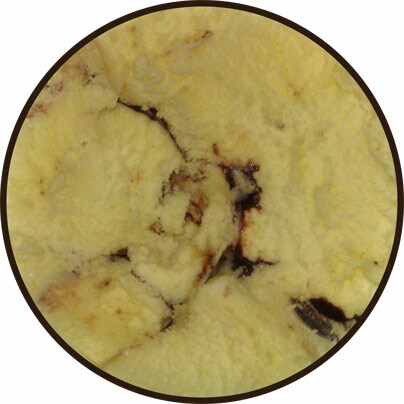 Then we have the semi-prevalent fudge swirl. It tastes very much like a thick icing, though it doesn't taste like a GOOD icing, just something generic. I ate about a about a third of the container and then headed back to work. My problem with the ice cream is that it's boring. The swirl just doesn't satisfy. I would have been much happier with brownie chunks. mmmmmmm. brownie ...oh sorry, anyway. They have the base, it just needs that !BAM! to make it a must buy. On the way home I had another thought: You know those nice bakery cakes with a layer of fruit filling? Well, what about a cake batter base with maybe a nice raspberry swirl? Hmmm, technically I could adding some and see how it goes.